My old apartment building in Yokohama had a similar sign on the walls separating our balconies. The sign is literal… the walls where these signs are posted are fragile enough to easily break with minimal force, so if there is a fire and you need to get out when the door is not an option, it is the proper route. This really doesn’t qualify as “engrish” because it is accurate. Time for some martial arts. 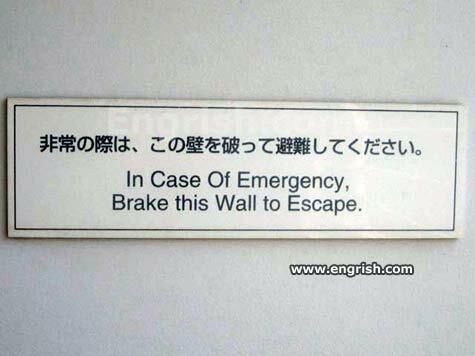 I’d rather jump out of the building than brake that wall. Wait, wouldn’t it cost MORE to replace the wall every time than instead, build a reusable emergency escape? So that’s why the elevator music is all Fink Floyd. It’s an emergency exit for the Kool-Aid Man. Is this in the superheroes office or something?